You take off from a platform at the stern (Back) of the boat, and at the end of the ride you are winched back onto the same platform. You don't have to get wet unless you want to. If you want a dip, let the captain know, and they will dip you before you come back on board. The captain and the parasail boat are licensed by the U.S, Coast Guard, and all of the crew is trained in parasailing operations to guarantee you the best experience possible. 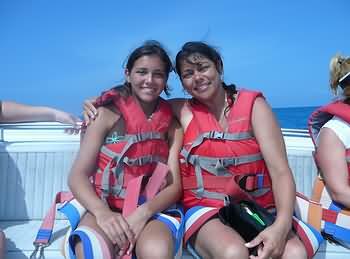 Parasailing In Destin Florida With Just Chute Me! Book Parasailing in Destin with TripShock.com! Board the parasailing boat from the Just Chute Me! dock at the new location at Aloha Pontoon Rentals, 194 Highway 98 East, and enjoy about an hours cruise around Destin. The actual flight takes 8 to 15 minutes. 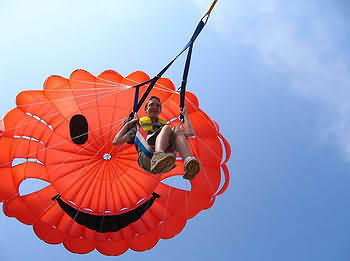 Just Chute me has over 17 years of Destin Florida parasailing experience, and 100,000 flights.